Monywa is a city in central Myanmar and situated on the eastern bank of the Chindwin River, Mandalay Division. It lies 136 km north-west of Mandalay along the Mandalay-Budalin branch railway line. Monywa serves as a major trade center for India and Burma through Kalay Myo road and Chindwin river. The name Monywa comes from "Mon" meaning "cake or snack food" and "Ywa" which is the Myanmar word for village. There is a legend which says that in the old days a Myanmar king fell in love with a seller of cakes from this town and made her his queen. The original name some say, is Mon - thema- ywa or " Village of the woman cake seller". There has been a big village at Monywa from the Bagan Period. The classical name for Monywa is Thalawadi. The chronicles mention that Monywa was one of the places where King Alaungphayar encamped for the night on his campaign to Manipur in 1758. During the Myanmar kings' time Monywa remained just a big village as the administrative centre for the region was at Ahlon. It was only a year after the Annexation of 1886 that Monywa became the Headquarters of the Lower Chindwin District. In the last few years with the legalizing of the border trade with India, Monywa has grown into a bustling trading. In Monywa town, there are busy markets, popular restuarants, a Degree College affiliated to Mandalay University, a Technical High School, and soon there will be an Institute of Economics, the second after the one in Yangon. Monywa Hotel, now privatised, has comfortable four-room bungalows with attached amenities, all air-conditioned. centre, second only to Mandalay in the Upper Myanmar region. If you are travelling to Monwya by car you should stop about 20 kilometres before you reach the town to visit this most unusual Buddhist temple complex on 37 acres of land which is part of the Mohnyin Forest Monastery retreat. The pagoda was started on 20th June 1939 and completed on 2nd March 1952.It was the brain-child of the famous Mohnyin Sayadaw whose life-like effigy can be seen nearby. If you can go at the beginning of the Myanmar month of Tazaungmone ( usually around November), you can see the annual pagoda festival, which goes on for several days when the villagers from all around come to enjoy the music and dancing, and buy from the various stalls set up by sellers from all over the country. Some visitors say that this Pagoda reminds them of Borobodur, as it is similar in architectural design. Unlike Borobodur this is a modern place of worship, well maintained, and with interesting samples of modern Buddhist art. There are many different Buddha images, row upon row in ascending tiers in niches along the walls: the total number is 582, 257, an amazing figure! Unlike most of the pagodas in Myanmar, the entrance is not guarded by Chinthes, the mythical lions, but by statues of a pair of magnificant white elephants which are sacred and auspicious in Buddhist symbolism. Thanboddhay is the only pagoda with this unique shape in the whole country. The square temple base (each side about 166 feet) which worshippers can enter is topped by receding terraces, with myriads of small stupas (864 in number) surrounding the central golden chedi, 132 feet in height. Tourists can study and take photos of the twenty tagundaing, huge decorated pillars, and also big masonary fruits in the shape of bunches of bananas and coconuts, water melon, mangos, jackfruits, papaya and so on . These fruits are also objects of veneration for the local farmers. From Thanboddhay Pagoda you can go by car about five miles along a good branch road to Po Khaung Taung, a small range of hills in the Monywa area. There you will see more unusual sights not found in other parts of Myanmar. First you should stop for a while in the fast growing forest of one thousand Bodhi trees (Ficus religiosa); this Bo or pipal tree is sacred to all Buddhists because Gaudama Buddha attained Enlightenment while meditating under this tree. A much venerated Sayadaw now popularly known as the Bodhi Tahtaung Sayadaw who can make your wishes come true, first started planting this forest grove about two decades ago. Each tree has a large Buddha image underneath, and many Buddhist come to pay obseisance there. It is a pleasant, peaceful place, filled with the song of birds, in a protected environment where nature and men are in perfect harmony. Just beyond Bodhi Tahtaung, a short stroll towards the east will bring you to the Po Khaung Taung, a range of hills where you can see one of the largest reclining Buddha images in the world. Measuring 300 ft in length it is even bigger than the colossal Shwethalyaung reclining Buddha image in Bago (Pegu) which has a length of 180 ft. only. The head is 60 ft. in height. It was only built in 1991 and up to now there is still no roof or shelter to protect it from the elements. This huge image has a hollow cave-like structure inside and you can walk from the head to the feet. You will then see inside 9,000 one foot high metal images of the Buddha and his disciples in various postures. There are also representations of some of the important events in the life of the Buddha. If you are interested in Buddha footprints you can study the 108 auspicious symbols which are depicted on the soles of this huge image. Near the reclining Buddha image, also on Po Khaung Taung range is the Aung Sakkya Pagoda , 441.75 ft in height (including the base of 216.75 ft). This pagoda is a landmark for the area around Monywa as it can be seen from afar. It is surrounded by 1,060 smaller satellite pagodas which shelter over a thousand sacred images of the Buddha. The hills have probably been occupied since the dawn of human habitation in Myanmar; to the south - west lies the Pon Daung Pon Nya mountain range, where the fossilised remains of Pontaung Mon's may have lived 30 million years ago - were found. The caves themselves contain Buddhist statues and murals dating to the 17th and 18th centuries. Most exhibit the Inwa style, though some may date as for back as the 14th to16th centuries. A covered stairway climbs a hill to the main cave shrine, but there are dozens of large and small caves in the area filled with old Buddha images. There are over 400,000 images in these and other nearby caves. Shweba Taung is on the West Bank of Chindwin river. There, temples and caves are curved out of volcanic rocks and inside walls of some caves are decorated with 13 century / 18 century mural paintings. The Shwe Gu Ni Pagoda is about 20 miles east of Monywa. The Buddha image in the pagoda is offered (stick) by gold foils and the face of the Buddha image could not be make out very easily. Typical black and gold lacquer ware from nearby Kyaukka is the festival's speciality. Held from the 5th to the 8th waning day of Kason. Shweguni Pagoda is famous for its magnificent architecture. Monywa can also be the base for visiting Kyaukka. Kyaukka , a town about ten miles to the east, second only to Bagan as a center for the Myanmar lacquer-ware cottage industry. A few hours drive will also bring you to Twintaung hill, an extinct volcano whose crater now forms a beautiful lake. The surrounding area has lush vegetation, and views of the area from the rim of this crater lake is breathtaking. The Ledi Kyaung Monastery is also well worth visiting. Built by the famous Ledi Sayadaw, a renowned Pali scholar, there are now 806 stone slab inscriptions which preserve some of the Sayadaw's writings. A few hours drive will also bring you to Twin Taung Hill, an extinct volcano whose crater now forms a beautiful lake. The surrounding area has lush vegetation, and there are lovely views of the area from the rim of this crater lake. Visitors are welcome to travel to Monywa and environs; see the interesting places and scenic views, and take back memorable experiences of typical Myanmar warmth and hospitality. Monywa is a city in Sagaing Division, Myanmar, located 136 km northwest of Mandalay on the eastern bank of the River Chindwin. It is served by the Mandalay-Budalin branch railway line, but is best reached by bus as the road from Mandalay is in reasonably good shape. Monywa is now linked by road to Budalin, Dabayin, Ye-U and Kin-U, and by rail to Sagaing and the Mandalay - Myitkyina line. River transport on the Chindwin has always been important as it is navigable for 640 km (400 miles) up to Hkamti during the monsoon season, and most of the year to Homalin. Monywa is a major centre for trade and commerce and for agricultural produce from the surrounding Chindwin valley, especially beans, orange, pulses and jaggery (palm sugar). In addition, the local industry includes mills for the production of cotton, flour, noodles, and edible oils. Sausages from Alon called wet udaunk are quite popular, and Budalin longyi (sarong) is known for the strength of the fabric and its checked patterns. Monywa's rough cotton blankets are famous throughout Myanmar, and some can even be found sewn up into knapsacks sold to unsuspecting tourists in Bangkok. Other regional crafts include bamboo and reed products, bullock carts and agricultural implements. The village of Kyaukka is well known for its lacquerware utensils for everyday use.Black market goods from India, especially saris and bicycle parts, pass through Monywa on their way to other parts of Myanmar.The major tourist attraction in Monywa (although very few tourists make it there, and facilities are very limited) is Mohnyin Thambuddhei Paya, a Buddhist temple with a huge stupa resembling Indonesia's Borobudur. It dates from 1303, although it was reconstructed in 1939. It is said to contain over 500,000 images of Buddha. The insurgent Burmese Communist Party (BCP) was centred in the Monywa area (west of the Chindwin River) for many years. Although the BCP is no longer active, the Myanmar military presence in Monywa remains heavy. Sagaing Division is an administrative division of Myanmar, located in the north-western part of the country between latitude 21° 30' north and longitude 94° 97' east. It is bordered by India’s Nagaland and Manipur States to the north, Kachin State, Shan State, and Mandalay Division to the east, Mandalay Division and Magway Division to the south, with the Ayeyarwady River forming a greater part of its eastern and also southern boundary, and Chin State and India to the west. The division has an area of 93,527 km², and population (1996) of over 5,300,000. The capital is Sagaing. Sagaing Division consists of 198 wards and villages, 38 townships and eight districts; Sagaing, Shwebo, Monywa, Katha, Kale, Tamu, Mawlaik and Hkamti. The major cities are Sagaing, Monywa, Shwebo, Katha, Kale, Tamu, Mawlaik and Hkamti. Mingun with its famous bell is located near Sagaing but can be reached across the Ayeyarwady from Mandalay. The Pyu were the first to in recorded history to populate the area of Sagaing Division by the 1st century CE. The Bamar (Burmans) first migrated into Upper Myanmar by 7th century CE. The area came under the Pagan Kingdom certainly by the middle of 11th century when King Anawrahta (r. 1044-1077) founded the Pagan Empire, which encompasses the modern day Myanmar. After the fall of Pagan in 1287, the northwestern parts of Upper Myanmar came under the Sagaing Kingdom (1315-1364) ruled by Burmanized Shan kings. The area was ruled by the kings of Ava from 1364 to 1555 and the kings of Taungoo from 1555 to 1752. 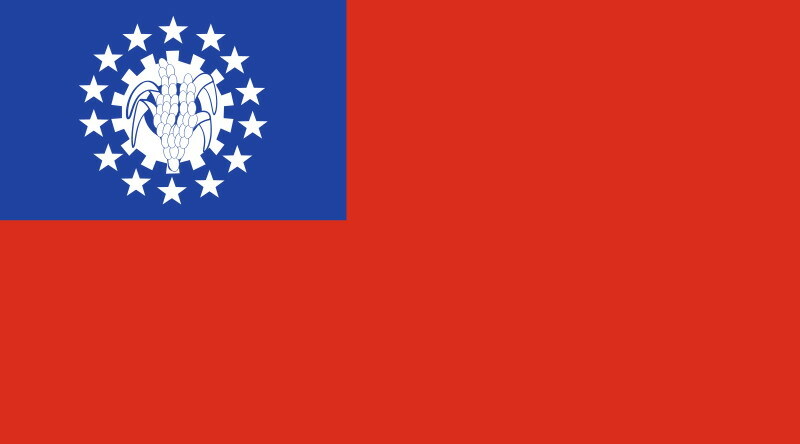 Konbaung Dynasty (1752-1885), founded by king Alaungpaya in Shwebo, became the last Burmese dynasty before the British conquest of Upper Burma in 1885. The area became Sagaing Division after the Burmese independence in January 1948. The Bamar (Burmans) are the majority ethnic group in the dry regions and along the Mandalay-Myitkyina Railroad. Shan live in the upper Chindwin River valley. A sizable minority of Naga resides in the north of north-west mountain ranges and Chin in the south. Smaller ethnic groups native to the Division include the Kadu and Ganang, who live in the upper Mu River valley and Meza River valley. Agriculture is the chief occupation. The leading crop is rice, which occupies most of the arable ground. Other crops include wheat, sesame, peanut, pulses, cotton, and tobacco. Sagaing is Myanmar’s leading producer of wheat, contributing more than 80% of the country's total production. Forestry is important in the wetter upper regions along the Chindwin River, with teak and other hardwoods extracted. As in other parts of the country, reforestation is not effective enough to maintain sustainable forestry. Important minerals include gold, coal, salt and small amounts of petroleum. Industry includes textiles, copper refining, gold smelting, and a diesel engine plant. The Division has many rice mills, edible oil mills, saw mills, cotton mills, and mechanized weaving factories. Local industry includes earthen pots, silverware, bronze-wares, iron-wares and lacquerware.